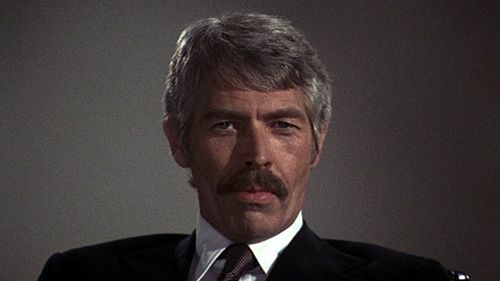 In The Internecine Project, James Coburn plays Professor Robert Elliott, a Harvard economist and author about to be appointed as the US President's economic advisor. The shady business/spy network to which he belongs has spent years manoeuvring him into this position. There’s just something he needs to sort out first – four people who all know too much about his past activities. Conveniently, all live in or around London where Elliott is currently staying. The four consist of a scientist (Michael Jayston), an official in the Foreign Office (Ian Hendry), a masseur (Harry Andrews) and an upmarket prostitute (Christiana Kruger). The latter two both gather information for Elliott from their clients, while Jayston has invented a sonic weapon that can kill by using high-pitched sound. Elliott devises a scheme whereby all four will kill each other over the course of one night, setting each one up as a murderer without them realising that they will also be a victim. The methods are strangulation, the switching of a diabetic's insulin, the sound weapon developed by Jayston's scientist, and an old-fashioned bump on the head. The Internecine Project is a peculiar film that plays like a black comedy without any laughs. Coburn's Robert Elliott is a callous murderer, and few of the other characters are sympathetic. With the exception of Lee Grant's largely irrelevant journalist, they all cover varying degrees of villainy. In that respect, in its amorality, as well as its cynicism and intimations of shadowy organisations influencing or controlling governments, The Internecine Project is very much a 1970s film, and specifically a post-Watergate film. The film was produced and co-written by Barry Levinson, an American producer who mostly worked in Britain in the 1970s, and is not to be confused with the more famous director. The script was apparently based on an obscure novel, Internecine, by Mort W. Elkin, and the film's co-writer was Jonathan Lynn, later better known as co-writer of the TV political satire Yes Minister, and the director of several comedy films, including Clue (1985), Nuns on the Run (1990) and My Cousin Vinny (1992). Lynn complained that not much of his script was used and the film does seem a bit scant on details and characterisation (and on running time, at less than 90 minutes). Much of the background is not really explained. We never find out precisely why Elliott has to murder these people or what exactly they know about him. Nor do we learn very much about the organisation he works for. The London setting is also a little odd, since Coburn's character is a Harvard professor and yet all the people he needs to bump off just happen to live in London. Conveniently, his ex-lover, Lee Grant's American journalist, is also in London. Coburn is reasonably solid as the protagonist, although he is almost upstaged by his splendid 1970s moustache and spends most of the film sitting in his chair, standing by the phone or looking at a map. The acting honours instead go to the supporting cast. Ian Hendry is effective as the Foreign Office official who struggles with his orders to kill a stranger in cold blood, and Harry Andrews plays his part, a vicious, cat-loving old misogynist, with particular relish. The supporting cast includes Keenan Wynn as Coburn's contact in his organisation and Julian Glover as a TV current affairs show presenter. There's also an Austrian actor with the glorious name of Rolf Wanka, who probably wondered why he always struggled to get cast in British films. The film's director, Ken Hughes, had a patchy career and is probably best known for three films he made over the previous decade; a well-regarded biopic, The Trials of Oscar Wilde (1960), the lavish family musical Chitty Chitty Bang Bang (1968) and the historical drama Cromwell (1970). On The Internecine Project, Hughes indulges in some presentational tricks to add some interest and there's also a typically chilled 1970s Roy Budd score to help keep things moving along. 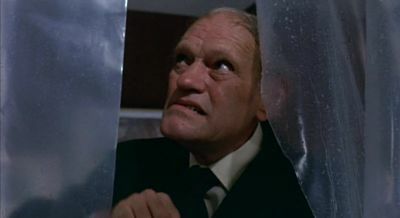 The film looks lowish budget and is slightly claustrophobic, with mostly interior and night time settings, and is gloomily photographed by Geoffrey Unsworth. The film was shot in and around London with interiors filmed at Shepperton Studios and at Arri Studios in Munich. It was one of two films produced by Levinson as part of a financing deal with the West German company MacLean and Co., together with the misjudged and bizarre sci-fi/spy story Who? (1974). Ultimately The Internecine Project doesn't quite work, because there's almost no one for the audience to sympathise with. Lee Grant's journalist character might have become that person, but she has little to do and is almost entirely surplus to requirements. The film's premise sounds like a black comedy but, other than one very subtle joke towards the end, the film is played completely straight and the result is an oddly humourless affair. The killings, including a hammer attack and a bloodless shower scene murder, are also appropriately grim and not at all Kind Hearts and Coronets-ish. The contemporary critical reaction was mixed and the distributors were also criticised for the paucity of publicity on its US release. The Internecine Project is now quite an obscure film and it's not hard to see why. It's humourless, mostly actionless and a little unpleasant. It's also very vague in its plotting and sketchy in its characterisation. Despite some interesting bits of casting, acting and direction, the characters and storyline seem notably underdeveloped, suggesting a lot more time should have been spent on the script before the cameras rolled.